In a land of flat plains there sits a ridge of hill, and on the very top one, the one always embraced by a cloak of mist, there dwells a beast. The people of Instep, the town closest to Kneeknock Rise, hold a fair each autumn, when the weather turns surly and the Megrimum atop the hill begins to moan. It is to this fair that Egan is bound. Here he learns the nature of the beast, and the best ways to ward it off–candles, onions, wishbones, poppies and bells. Especially bells. Bright-eyed people happily shared exciting tales of mystery and dread, for the Megrimum was “frightful and fine and it belonged to them.” But is it a beast at all? 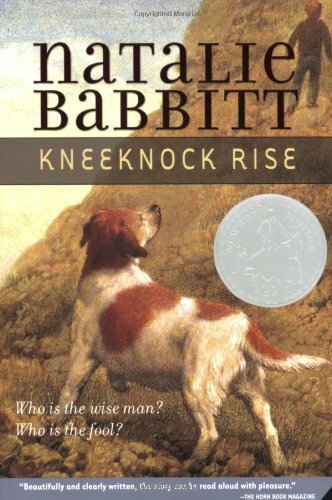 Natalie Babbitt creates a wonderful tale that took Newbery honors in 1971. I did not, however, like it as much as Tuck Everlasting, but that’s hardly fair. I’ve had an ongoing love affair with Tuck for twenty-five years. Kneeknock Rise, though written earlier, is completely new to me. But it just doesn’t reach the depth of insight and beauty that Babbitt achieves with Tuck. And left it there for dead. To put it another way: You can’t talk a fool out of deluding himself. I got it on recommendation from Erik at thiskidreviewsbooks. Great book! Guess what! I read “Tuck Everlasting” for a “Reading Olympics” book (It’s an activity in school)! Like you, I think “Tuck Everlasting” is better, but I like the idea of it and who/what the “Megrimum” really is! I bet you get gold medals in that activity, lol! I liked the mystery surrounding the Megrimum, too. And Babbitt just knows how to put together a good package. I’ve been extremely honored to have a few people tell me The Quill Pen reminds them of Tuck Everlasting. That’s funny – when I read the line “Mae Tuck couldn’t die” in Tuck Everlasting I told my mom it reminded me of your line “Sanjay couldn’t die” in The Quill Pen! That’s funny! I didn’t even realize that. Must have been subliminal from the half a dozen times I read the book as a kid. The line does make a great cliffhanger, though. Everyone always asks me, but The Quill Pen wasn’t inspired by Tuck. I never even intended it to have a life/death theme. It just evolved during my many rewrites.